- Mill Linings: Ball and Pebble Mills may be lined with rubber, ceramic and wear resistant metallic liners. - Grinding Media: Mills may be charged with ceramic, steel and alloy steel grinding media. These are spherical or cylindrical in shape and range from 6 mm to 100 mm in size. The whole set-up is well designed and arranged in: good quality painted structure. 40 x 25 mm: 0.25 H.P. 65 x 25 mm: 0.25 H.P. (B) -do- S.S. Drum 2 Kg. capacity. (C) -do- Aluminum Drum 1 Kg capacity. (D) -do- Aluminum drums 2 Kg. capacity. 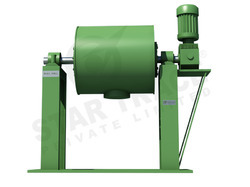 The Laboratory scale Ball Mill is mainly used for various grind able materials dry or wet type in Chemical, Pharmaceuticals, Herbals and Catalyst Industries for super fine micron size grinding. Electrically operated having a cap. from a few gms. to 1 kg, 2kg, 5 kg. 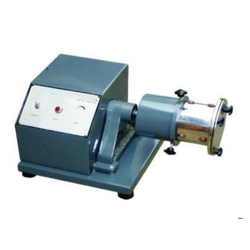 We are devoted towards offering the qualitative range of Laboratory Ball Mill, as per client’s precise need and requirements. Having a definite quality management system, we are engaged in manufacturing and exporting optimum quality Horizontal Slurry Ball Mill.